The floorboards creaked under my weight. There were books everywhere. There were pens, and a blue glass vase, an ashtray from the Dolder Grand in Zurich, the rusted arrow of a weather vane, a little brass hourglass, sand dollars on the windowsill, a pair of binoculars, an empty wine bottle that served as a candle holder, wax melted down the neck. I touched this thing and that. At the end, all that’s left of you are your possessions, Perhaps that’s why I’ve never been able to throw anything away. Perhaps that’s why I hoarded the world: with the hope that when I died, the sum total of my things would suggest a life larger than the one I lived. Leo Gursky, a man who escaped the Nazis in Poland before following the love of his life to New York City, is staring a lonely death in the face. He has one friend, he makes a scene when in public so that people will remember him, and he is willing to embarrass himself just to be seen. He is alone, the love of his life is dead and his son doesn’t know he exists. Leo is full of wit and wisdom and sadness. I just wanted to give him a hug. Alma Singer is a girl who wants to know who her namesake is. Her dead father had given her mother a book, The History of Love, and the woman in it, Alma, represented all women. Young Alma’s search for the author provides the catalyst and the mystery for this original novel. The language is beautiful and the story bittersweet. It is both funny and confusing, touching and depressing. It came close to being perfect for me and I loved it. It is very difficult to describe, but pick it up and take a look. It may be just the unique voice you are looking for. It’s Banned Book Week. Can you guess these 10 most challenged books of 2009? 10 points each (5 points title, 5 points author. You have until Thursday at midnight to submit your answers as a comment. I hide your answers until then. Here are the rules… 1. Open to everyone. Play once or every week, that’s okay. I’m happy to have you here today. 3. Your first answers will be the only ones accepted. Last week’s Stephen King Adaptation Quiz here. Current Leaderboard here. Jason went white water rafting in West Virginia for 4 days and my Mom came up to hang out with me while he was gone. She was lucky enough to be here when the club I’ve been a member of for 8 years threw me a shower. Well it was really my friend Jean hosting and Shandra helping her out. In addition to the shower we did fun things like a luncheon with the club, book shopping, showing my Mom where the hospital was, going out for hot fudge sudaes at 10:30 pm, and a nap everyday! Not bad, right? 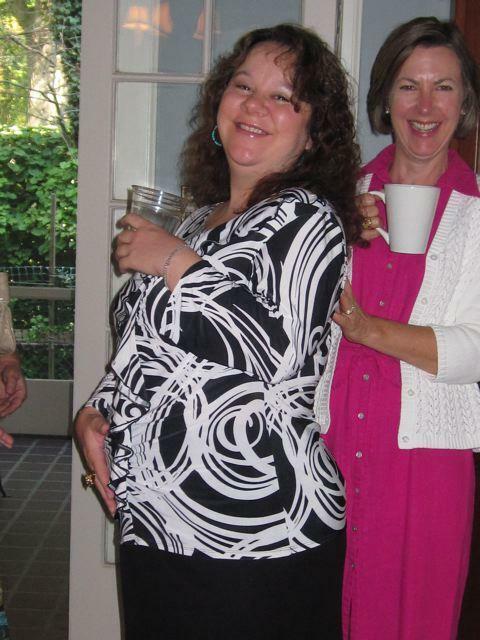 Thought I’d share the latest big belly pic at the shower. I’m with my friend Karen. *Can anyone see this? I’ve tried to get the pic on here a few ways and am not sure any of them have worked. This trilogy, based on the fantasy books by JRR Tolkien, is based in Middle Earth in a dangerous time. The dark lord Sauron wants to rule over Middle Earth and he must find the One Ring that can make that possible. The wizard Gandalf, four hobbits, two men, an elf, and a dwarf form a fellowship to destroy the ring, but there are many evil forces at work and they don’t all make it to the end. Why I love it– I think this trilogy tells the perfect story. It is the quest for good in a world turning evil. There is betrayal, redemption, forgiveness, honor, death, love, and loyalty. It has all of the classic themes that make a story satisfying. Not to mention the idyllic beauty of the movie itself. Filmed in New Zealand it definitely made me want to take a trip. 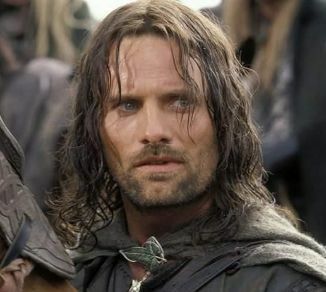 And with the first film, so began my love affair with Aragorn or Strider. I call him both depending on my mood. I mean, c’mon, look at this guy. He is the strong hero, the future king, and all hotness. I liked the movies as a whole, although the Fellowship of the Ring was my favorite. I loved the bond between the nine. Frodo was the ring bearer, but the other eight were there to make sure he completed his dangerous task. In the second and third movies the fellowship was working for the same purpose, but not together. I read the first of the series in college and loved it and it’s been too long for me to make a comparison, but I loved the way this came to life on the big screen. I loved the acting, the sets, the music and the story. I don’t watch a lot of fantasy films, but this is one I’ve watched more than once which quite a commitment since it runs 558 minutes (or 683 if I watch the extended version). Was she crazy? Had she just escaped from an asylum? From jail? Was she on the run? She laughed at her own histrionics. If she hadn’t been crazy before all this started she certainly would be by the time it was over. Would it ever be over? Jane is aimlessly walking around Boston, not knowing who she is or why she’s there. She has blood on her dress and $10,000 in her coat pocket, so she checks into a hotel to get her bearings. After a few days she realizes her memory is not coming back so she turns herself over to police, who in turn send her to the hospital. She is told that she had temporary amnesia and in a stroke of luck is recognized by one of the nurses. Jane’s husband, Michael is a pediatric surgeon at another hospital. The two are reunited, but Jane is still lost and confused. The premise is a terrifying one. All of the sudden to be in a big city, not know who you are and to realize no one is looking for you would be quite a shock to the system. Jane was an interesting character. Since she didn’t know who she was I wasn’t sure who she was either. I grew frustrated at her docile ambivalence to her situation at home, especially when she was repeatedly told how feisty she really was. Who was the real Jane? It’s a page turner, but my frustration with Jane and the too long chapters on her contemplating her unknown life kept it from being excellent. I kept wanting it to read faster. But once things started happening halfway through the pace and story picked up. The end was great and I did enjoy it. Most of us have seen at least one film based on a Stephen King novel or short story, so this week let’s see if you can place these faces with the Stephen King movie. You only need to tell me the movie (not the actor’s name or character). They are all direct adaptations and the images may or may not be from the King movie – I can’t make it that easy! Each question is worth 6.5 points with a bonus question worth 2.5 points. You have until Thursday at midnight to submit your answers as a comment. I hide your answers until then. Last week’s Signed Book Quiz here. Current Leaderboard here. Share on your blog movies about aging or being elderly, linking back here at The Bumbles. This one was hard. I guess as I haven’t watched many movies on aging, but here area few I enjoyed. 1. Something’s Gotta Give (2003) I’m not always a Jack Nicholson fan, but he did win me over with this one. And I always like watching Diane Keaton on the big screen. 2. The Bucket List (2007) That Jack Nicholson film made me think of this one with Morgan Freeman. What’s on your bucket list? 3. Terms of Endearment (1983) And that Jack Nicholson movie made me think of this one. I was only 12 when I saw it for the first time and I cried buckets. 4. Two for the Road (1967) Audrey Hepburn and Albert Finney are a married couple and the movie covers their 12 year marriage. 5. The Rocky series (1976, 1979, 1982, 1985, 1990, 2006) Taken as a whole these six movies starring Sylvester Stallone show how the boxer aged. The last one, Rocky Balboa, was especially poignant as he faced the choices he made in his life. Do you have a favorite? Visit the Bumbles and see what other chose. Journalist Ehrenreich sets out to discover if a single woman can support herself on a low-income budget. She tries waitressing in Key West, housekeeping in Portland, Maine, and retail (Walmart) in Minneapolis. She spends a month in each place and must find herself housing and work and see if she can make it work. She also starts with a buffer of $1,000 and a car. She doesn’t use any of her money for entertainment, in fact in two cities she has to get a second job just to make ends meet. 16. Nickel and Dimed takes place in 1998-2000, a time of unprecedented prosperity in America. Do you think Ehrenreich’s experience would be different in today’s economy? Given the state of the economy and the rise in poverty this has just as much relevance today as it did when Ehrenreich wrote it. She worked low paying jobs, but had all the advantages (single, educated, white, healthy, native English speaker, owned own transportation) and still could not make it. At least in the short run. I think the weakest part of the book was the short run of her trials. It would have been interesting to see how different her experience might have been if she had tried one of the stops for a longer term. The result may have been different. There were a few surprises. She didn’t have a problem finding a job and the lack of housing in Minneapolis. I also learned a few things. Don’t hire a maid and how to beat a drug test. Most of the book was not unexpected, only eye-opening to most of us who don’t live it everyday. This book is an important read. I think if more people read it it would be more difficult to vilify people who want to work and do, but still can’t afford to live without help. Do yourself a favor and take a look. It might challenge some assumptions. Chub was stunned at his friend’s theory. He didn’t understand how the lottery could be rigged. If it was, how had he and Bode managed to win even half? Bode and Chub have just won the Florida lottery and hope to get their racist militia, White Clarion Aryans, started. When they find out there was another winning ticket and they would have to split the $28 million they decide to find the ticket and steal it so they could have all of the winnings to themselves. JoLayne Lucks is a single woman who plans to use her $14 million to rescue swampland from commercial development. When she is attacked by Bode and Chub all hell breaks loose. The premise is fun as is the wackiness of Hiaasen’s writing. No one gets a pass in this one. The horrible and awful Bode & Chub would have been more funny only if you didn’t realize that there were plenty of idiots like them out there. And the religious zealots and the people who take advantage of them provide plenty of zaniness. The two heroes of the novel are JoLayne and reporter Tom Krome provide the common sense and the common good of the novel. I liked this one, but my distaste for Bode and Chub probably stopped me from liking it more. I thought the end was maybe a bit too easy for me, but not really bad. With such a crazy cast of characters I was expecting more of a crazy ending. But, Hiaasen always pushes the envelope and is always funny, so you really can’t go wrong with his books. I have a lot of books. Many unread for the decade or more that I’ve owned them. But since I’ve started blogging I have picked up books at sales based on bloggers recommendations and have won more from blog contests. So, this past December I collected all of my books, took a picture, and asked my online and face to face friends to vote for 50 of the books I would read this year. The post is here. After 72 voters voted for up to 5 books each I had my 50 books. The RYOB Challenge here is where I list the ones I’ve agreed to read and who voted for each one. I also include their names and links with the review when I post it. I’ve only read 29 out of 50 so far. That’s not so good, but I’m still plugging along. The two chosen that were most outside my usual reading comfort zone were War & Peace by Tolstoy and The Glass Castle by Wells and I ended up liking them both. I’m sure that The Glass Castle will end up on my year end favorite list. Having book lovers choose books for me from my overflowing shelves has been a great experience and I plan on doing it again. Fifty may have been too many, but we’ll see what I can accomplish.